Occupying a fan-shaped plot along the ring road, sliced through by a waterway, are these seven brief blocks of gallery-accessed maisonettes. The blocks step back in two stages from five to three storeys to accommodate the great change in scale between the ring road at the front and the intimate courtyard at the rear. 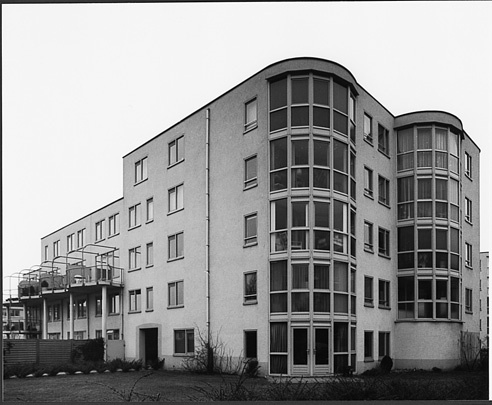 In this courtyard are four oblong blocks of low-rise with rounded ends. Containing linked single-family houses, the depth of these blocks decreases with each succeeding storey in a stepped profile. Notable features are the strip of sun lounges on the garden side and the narrow glazed roof with semicircular peak.